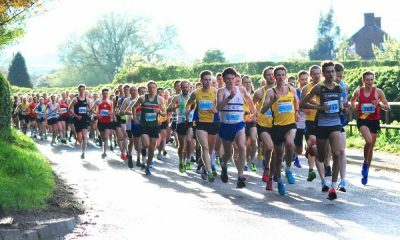 It was a jam-packed weekend’s racing with the National Road Relays, a women’s overall win at the Kent Spring Marathon, the Sandy 10, 10ks in Lincoln, Port of Blyth and Derby and half marathons at Paddock Wood and Norwich! 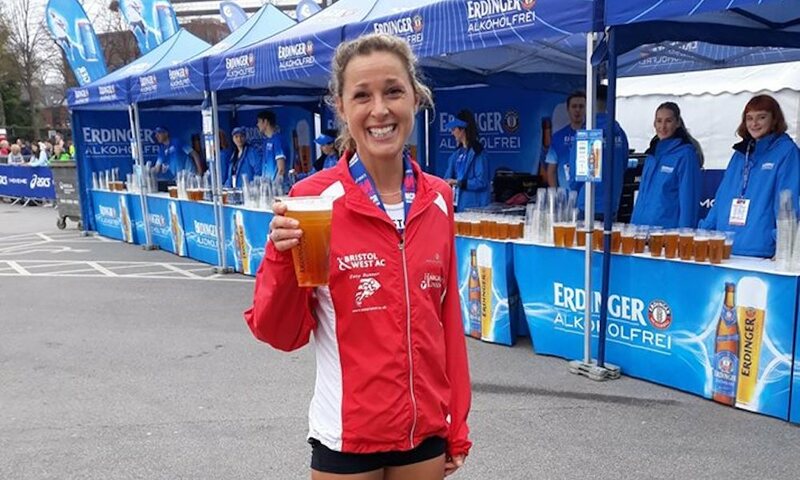 Bideford’s Aaron Richmond ran the race of his life to knock two minutes off his lifetime best and win the Manchester Marathon on Sunday (April 7) while Bristol & West’s Jenny Spink fulfilled her marathon promise to take the women’s title by a massive four minutes. Richmond has come on leaps and bounds in the last two years, revising every PB going from his Devon base. His 16th at the Southern Cross Country Championships pointed towards great things to come on the road, and, following a 65:44 for fourth at the recent Bath Half Marathon, it’s clear the Bideford man is in form. Finishing nearly five minutes behind but still putting in an impressive performance was Sale Harriers’ V40 ace Gareth Raven, whose 2:26:07 result here represented his first marathon in four years. Raven’s best is a superb 2:18:49 from 2004, but he seems to be rounding into yet another purple patch following his run in Manchester. It was a far closer affair for the next five athletes, all of whom broke the 2:27 barrier, finishing within 40 seconds of each other. Ultimately it was Jo Corbett who took the third prize in 2:26:13, although without a club to his name it is unclear whether this was a PB or not. 37 year-old Spink was a dominant winner of the women’s race, her 2:35:19 nearly 40 seconds faster than her previous best from 2015. 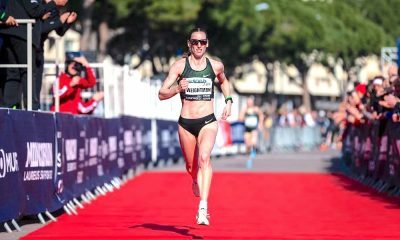 In those intervening years the sports masseuse and mum has posted numerous strong marathon performances, but this result confirms she is back in business at the top end of the British distance racing scene. Talented Scotland-based Hungarian Fanni Gyurko finished just two seconds outside her PB with a still strong 2:39:50 clocking. The Central AC athlete is a near-ever present on podiums north of the border and will take heart from her gutsy run in Manchester. Making up the top three was top veteran Johanna O’Regan from St Neots Riverside Runners, the V35 clocking a three minute PB when she finished in 2:42:15. Last year’s Chester Marathon winner only started competing a few years ago, and has reduced her half marathon best from two hours to 78:33 in less than six years! There was a rare but wonderful overall winning result at the Kent Spring Marathon on Sunday (April 7) when Woodbridge Shufflers’ Heather Noone beat all the men and women to win the race in 2:49:32. Noone is from County Mayo in Ireland but lives in London. 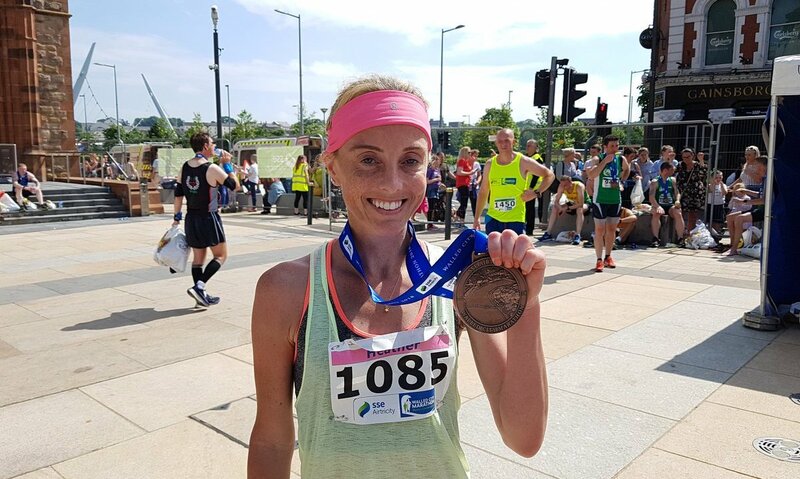 She showed an innate talent for distance running when she won last year’s Derry Marathon on her debut in 3:05:33, and promised to have another crack at the event as soon as she crossed the line. She did that in style to win the Kent Spring Marathon by more than 13 minutes! Second across the line and the first man was Marcin Smolak, who recorded a time of 3:03:13, ahead of Adam Versteeg’s 3:06:00, while Carl Adams made up the men’s podium in 3:12:37. The second lady to finish was Claire Towell in 3:34:00, with Rochford Endurance & Distance Runners’ Jennifer Bishop running 3:46:47 for the third lady’s prize. The Lincoln 10k always promises to be a fast and furious affair, and this year’s event was no different (April 7). England international Lucian Allison from home club Lincoln Wellington was nearly a minute clear of the field to win in 29:28 from City of Hull’s Kris Lecher’s 30:16. Finishing with exactly the same time but classed as third overall was Lincoln Wellington’s Joe Wilkinson, who nevertheless clocked a five second PB as consolidation. Allison’s club mate and fellow England international Abbie Donnelly won a fiercely contested battle for the women’s title by just five seconds. Donnelly clocked 34:30 to Newark’s Cloe Hubbard’s 34:35, the latter recording a near three minute PB in the process. City of Hull had another prize winner when the club’s Becky Briggs finished close behind in 34:53 for third. Special mention must also go to Newark’s Becky Gallop. The 37 minute 10k athlete was some way down on her best with a 42:56 result – but she is also six months pregnant! That’s some going! Steph Twell was in superb form at the Cherry Blossom 10M in Columbia when she clocked a PB of 52:58 to finish 8th in a stacked field in the Washington DC event. The Sandy 10 saw some gutsy performances before the heavens opened on the Bedfordshire race HQ on Sunday (April 7). Riverside Runners St Neots had another top prize winner here when Caroline Brooks took the title in 63:05 from Kathryn Liptrot. 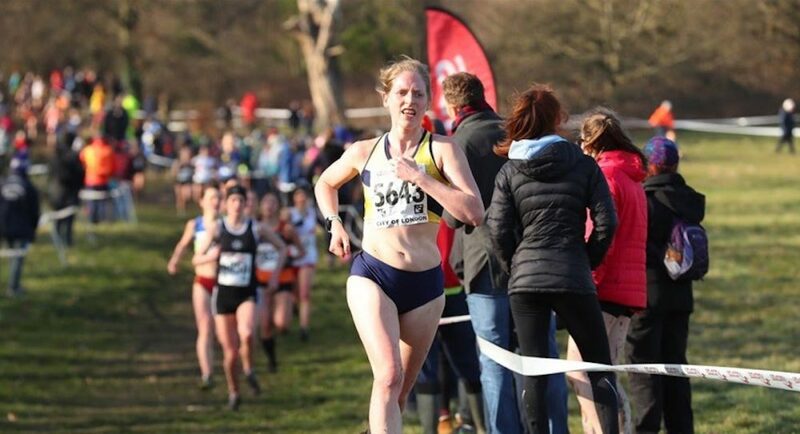 Liptrot clocked 65:58, while Nene Valley Harriers’ V35 Laura Grimer proved the importance of never giving up despite being beset with injury and illness when she finished third in a PB of 67:45. Trent Park RC’s Charles Bruce took the top men’s prize in 56:18, the V40 topping a podium made up entirely of veterans! Peterborough’s Kirk Brawn was second in 56:32, while Royston Runners’ Paul Makowski scored a big PB, his purple patch continuing with a superb 56:41 result. Derby AC’s Alex Pilcher and Lisa Palmer-Blount kept the city’s 10k race trophy on home turf when they both won the Derby 10k in 31:32 and 36:29 respectively (April 7). The club’s Veleska Wills was second woman in 36:45, while Blackheath & Bromley Harriers’ Carolyn Johnson ensured it wasn’t a podium clean sweep when she swiped third in 37:06. Pilcher was followed home by 2017 winner Heanor’s Joe Rainsford in 31:51. The third man home was Sutton in Ashfield’s Sam Moakes in 31:59. There was a fast winning time for ever-green veteran Nick Torry from Serpentine AC when the V40 former international took the title at the Paddock Wood Half Marathon in 65:34. The 2:15 marathoner’s time here today represents his fastest in five years – could this be a return to the top flight for the amiable 42 year-old? Torry’s club mate Andy Greenleaf was a strong second in 66:46, while Medway & Maidstone’s Tewelde Menges was third in 67:18. Taking the women’s title was Team Bath’s Eilidh Bell, who won by more than three minutes in 79:03. Second lady across the line was Haywards Heath’s Emma Navesey in 82:23, while Dartford’s Cas Wright took third in 82:45. It was a classy affair at the Port of Blyth 10k, which also incorporated the British Masters 10k Championships (April 7). GB international Aly Dixon took the women’s title in style in 33:28, the Sunderland Strollers’ fastest time in four years! Also running superbly were Vale Royal AC’s Liz Renondeau and Jarrow & Hebburn’s Georgia Campbell, the two ladies finishing just four seconds apart in 35:45 and 35:49 respectively. MK Distance Project’s Noah Hurton took the men’s title in 31:18, 20 seconds clear of second placed Richard Mair from Kilmarnock Harriers. Blackhill Bounders’ Jordan Bell took the third prize in 31:45. The City of Norwich Half Marathon saw an utterly dominant win for the home club’s Piers Arnold, who demolished the opposition by winning in 67:41, more than five minutes clear of the second runner home. Reepham Runners’ V40 Dominic Blake was second in 72:53, while Bungay Black Dog’s Matt Spencer took third prize in 74:30. The home club’s Mabel Beckett also kept the trophy on home turf when the CONAC athlete took the win in 80:11. Waveney Valley’s Sam Lines was never far behind in second with a 81:30 result, while Taunton’s Kate Drew was third in 82:52. The Cambourne 10k near Cambridge is always a testing challenge for road runners, the race taking athletes across every terrain imaginable and often in windy conditions too (April 7). This year’s event was won by Johannes Arnes in 35:11 and Peterborough’s Sarah Caskey in 41:01. 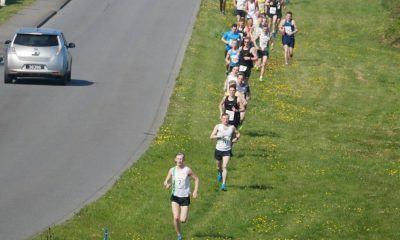 Arnes was 10 seconds ahead of second placed Martin Amos, while Ty Farrer took third in 35:40. Peterborough’s Caskey has fought hard to get back to her best so hopefully her win here today will boost her confidence ahead of her next challenge – the notoriously tough Brathay Marathon in May. Second across the line just four seconds behind was Olivia Baker in 41:05, while Cambridge & Coleridge’s Rachel Porter took third prize in 42:09. 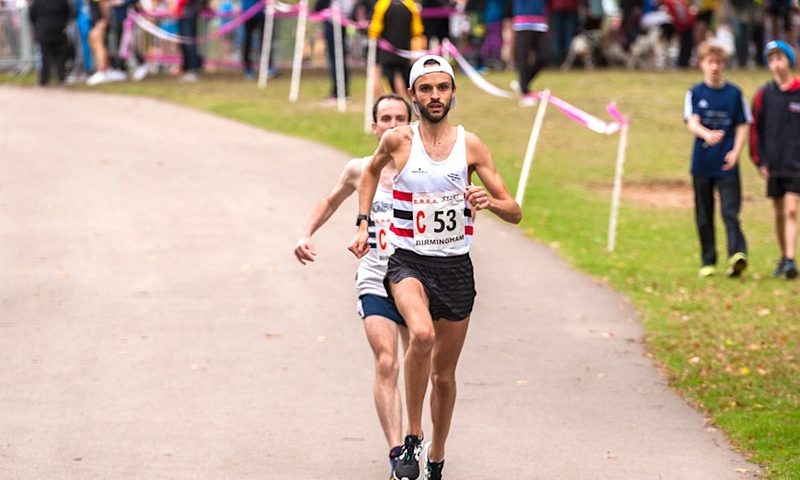 Leeds City won both the men’s and women’s titles at the National 6 and 12 stage Road Relays at Sutton Park, Birmingham on Saturday, the first time a club has taken both race wins in the event’s history. One last race to look forward to tonight will be the Carlsbad 5000m elite races in California, with the women’s kicking off at 8pm UK time and the men’s at 8.25pm. Jenny Nesbitt, Alice Wright, Beth Carter, Charlotte Arter and Jake Heyward lead the British challenge, so keep an eye out for the results of this exciting event! 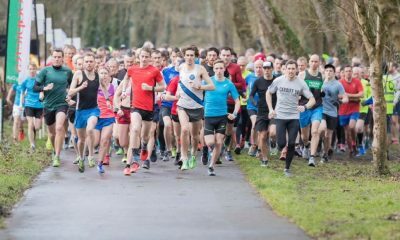 Back in the UK, Naomi Taschimowitz and Andrew Heyes were the fastest parkrunners on Saturday (April 6), clocking 14:18 and 16:44 respectively. Check out the full top ten report here to find out who else beat 15 minutes and 17 minutes in the men’s and women’s time trials.